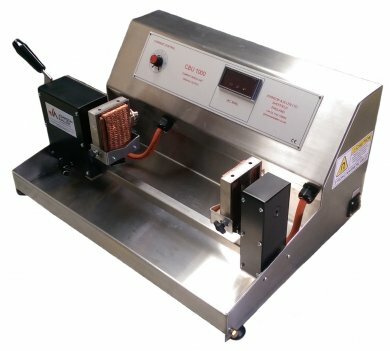 The CBU 1000 is Johnson & Allen’s smallest entry point MPI bench unit to date. With a compact, economical and full stainless steel design the CBU 1000 is ideal for environments where space is at a premium and for customers on tight budgets. The CBU 1000 features AC current flow mode for inspecting components longitudinally with bi-directional fixed coils available for inspecting circumferentially if required. The CBU 1000 can achieve variable outputs from 0 of 1000 Amps AC in current flow configuration, with output being adjusted using the single control dial on the front panel. The CBU 1000 extremely easy to operate making it ideal for small volume inspection and training schools. Johnson & Allen pride itself on high quality design and construction which is why the power transformers and coils used in the CBU 1000 are wound, built and extensively tested in-house before they are installed. All Johnson & Allen bench units are designed and manufactured by our experienced team in Sheffield and built to last. The CBU 1000 features a variable position headstock that use a simple lever operated clamping mechanism to grip components up to 300mm in length between the Copper braid pads. The pads are easy to replace and can be removed in a number of seconds for minimal down time. The headstocks also feature mounting supports (in front of the contact pad) as standard, so that components can be positioned between the headstocks before being clamped. Can be supplied with range of accessories including threading bars, bi-directional rigid fixed coils, headstock mounted ‘V’ brackets, mini-jigs and UV inspection lamps. The CBU 1000 is the smallest MPI test bench unit on market, weighing less than other MPI test bench units as well. Fitted with adjustable feet the unit can be setup on almost on work surface and also includes a drainage outlet in the front tray. This makes the CBU 1000 simple to re-site and transport if necessary; even in smaller vehicles. With quick dispatch every CBU 1000 is supplied fully calibrated and with heavy duty energising foot pedal as standard.